It's hard to believe that less than 10 years ago it was difficult to buy a good loaf of bread in much of the UK. We all know why. The Chorleywood Process has a lot to answer for. Not just for propagating bad 'bread' but for turning it into such a cheap commodity that small independent bakeries couldn't compete with the fast, mechanised production process it introduced. Bakeries disappeared from the high street. It's been a long haul but now most towns boast a decent baker using traditional leaven methods of baking, though they'll most likely be found well away from the High Street. Many of us even make our own bread from time to time in homes where pots of sourdough starter rise and fall on many a kitchen work surface. But it's a time-consuming activity, and it's the time - the thing those Chorleywood scientists were so focussed on reducing - that really matters. Stripped of the hydrogenated fats, the flour treatment agent, the bleach, the emulsifiers and preservatives we are left with flour, water, salt, which requires an injection of time. With the return to basics, some bakers are now turning their attention to the quality of the ingredients, which means the grains - the growing, the milling and the using. And it's this, along with producing excellent bakes that is the focus of attention at Landrace Bakery which opened last week in Bath. Producing naturally leavened sourdough from organic British-grown stone-milled flours they are already producing outstanding loaves with a moist crumb and really satisfying depth of flavour. It would be hard to think of a more intimate bakery. The baking is within easy ogling distance of the counter which is stacked with dough and pastry bakes. 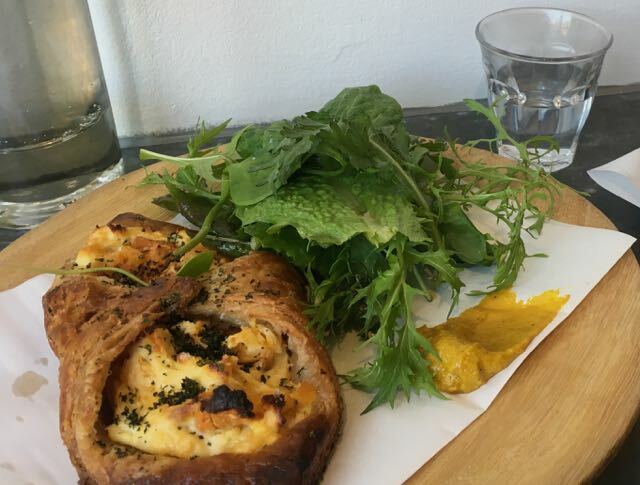 So if you're looking for lunch and can't choose between pumpkin and ricotta pastries or a Westcombe cheese toastie, you can keep an eye on the progress of the sausage rolls puffing up beautifully in the oven. There's a light-filled cafe area with a window which opens onto the street in summer. Sourcing is clearly very important to Landrace Bakery. Ricotta and cheddar from Somerset's Westcombe Dairy, eggs from Cacklebean Farm in Gloucestershire, butter from Fen Farm Dairy, flours from Gilchesters Organics, chocolate from Pump Street, coffee from Workshop Coffee and fabulously fresh salad leaves from Bath grower Undercliff Urban Farm. It's an impressive ingredients list which Landrace Bakery are certainly doing justice to. For the moment they have a small milling machine to experiment with whole grains, and interesting plans for a "flour club" for customers. You'll find Landrace Bakery close enough to the city centre but off the tourist drag, on Walcott Street. 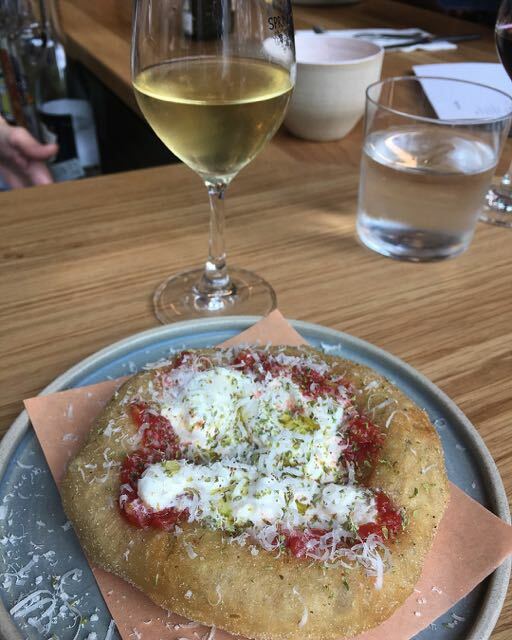 A few doors down from the Fine Cheese Company, Landrace fits perfectly into what's known as the 'Artisan Quarter' of Bath. On my visit locals were pitching up to try out the newcomer to the neighbourhood, and they seemed as taken with their new bakery as I was. 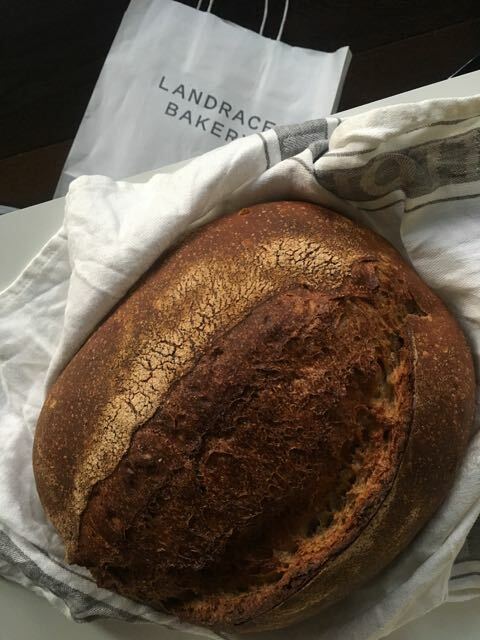 So why the name Landrace Bakery? Broadly speaking, 'Landrace' translates as a 'domesticated animal or cultivated plant which has, over a long period of time, adapted to the local natural environment in which it lives'. The name, I believe, tells you a lot about the intentions of Landrace Bakery. This place is only going to get better with time. 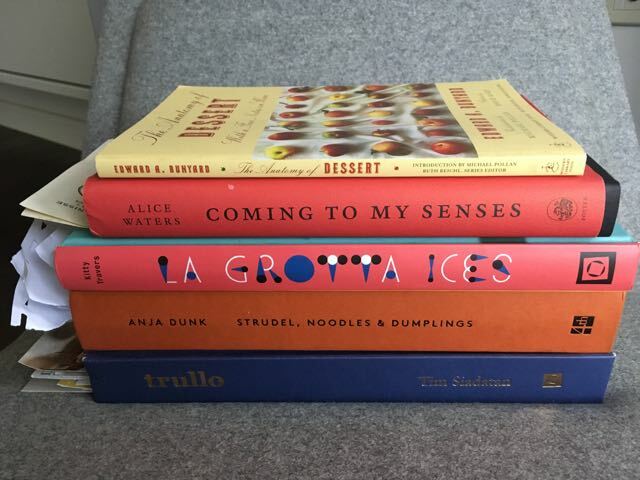 Halfway through December, it's time to remember the food books that have proved deserving of their shelf space in 2018. From this year's publications, there's a book of no-nonsense do-able food that banished my preconceptions of German cuisine. Summing-up traditional home-cooked German food as “gently spiced, smoky, buttery, yet sweet and sour”, and as “warm and hearty and vinegar-laced”, the author celebrates the positive influences migration and trade has had on German food over the past seven decades. 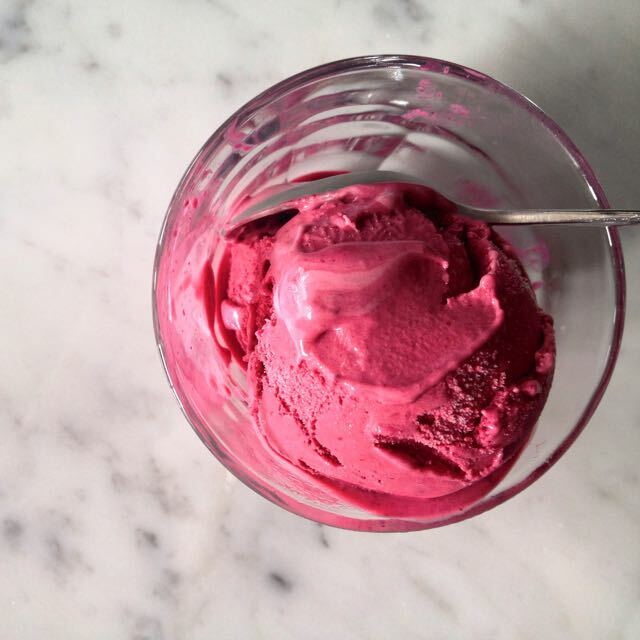 For dessert, there's a highly seasonal book on ice cream that will have you measuring your year in ice cream scoops, longing to pick your own blood oranges in Sicily and closely guarding your source of Loganberries. There's a 2017 publication that slipped my net last year and I'm so glad I finally scooped it up for its attention to seasonality and ingredients, and, not least, for its chapter on pasta. I've included a re-print of a book which was out of print for some 70 years. And there's a memoir of a true food hero to round things off. I'm late to Tim Siadatan's book and there are so many recipes I still want to try that I feel I've barely mopped a plate, yet here I am recommending it. Normally I like to really get to know a recipe book before I list it but I have been several times to the Highbury Corner neighbourhood restaurant - Trullo - where most of the recipes were created - so I know what we have here is straightforward "serious cooking" ... "without the seriousness", as the author puts it. The book is based on the author's initial focus on classic regional Italian food married with the creative freedom which comes from having his own restaurant. Previously he worked at restaurants like Fifteen, St John and Moro. There's good practical advice on equipping your kitchen: buy quality pans and learn to keep a knife sharp rather than spend money on an expensive one; what to stock in your fridge and dry store; and how to be thoughtful about your ingredient choices. I've cooked the last of my allotment-grown pumpkins in a dish of Gnudi and pumpkin ricotta that were as fluffy and light as promised. 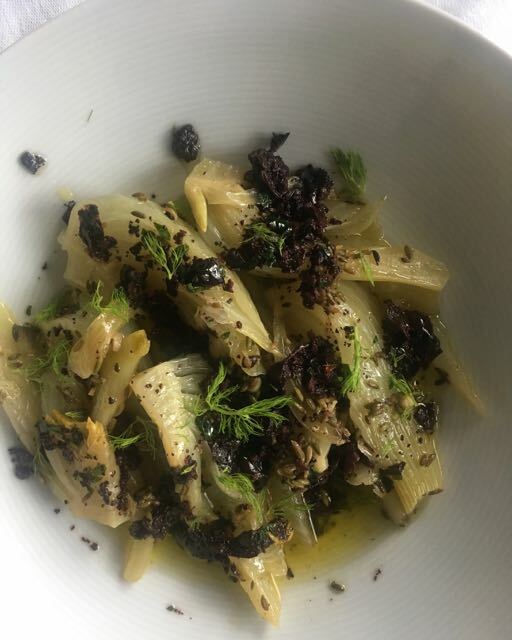 I've served-up Braised fennel and purple olive dressing which was as fresh and zingy as I was led to believe it would be. I want very much to eat a bowl of Cannellini beans, King cabbage and pancetta. 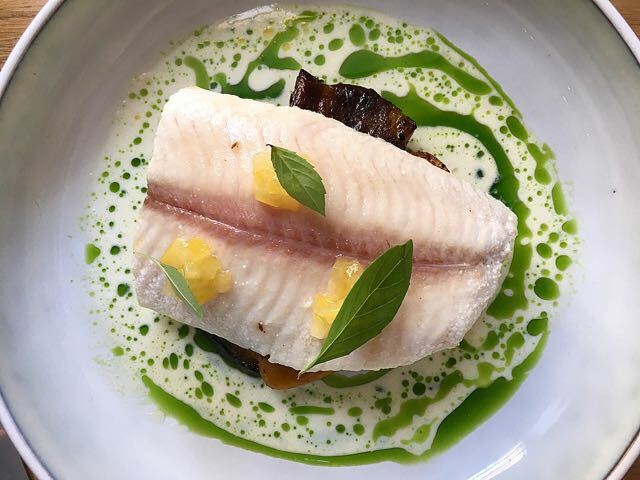 A Whole baked turbot with poached leeks and aioli is also on my mind along with a Chocolate tart which the author learned to make during his time in the kitchen at Moro (enough said). And then there's the pasta which is treated with immense respect both in the restaurant and in this book. More than 40 years after opening her seminal restaurant and cafe, Chez Panisse, Alice Waters finally tells the inspiring story of what motivated her to create what was to become the most influential food movement in America. Living through highly-charged political times, searching for something to believe in, she transformed her nation's relationship with food. I've been lucky enough to eat there several times over the years - though this is a reminder that it's been a while now - and there are few places in the world where I've felt so completely happy. 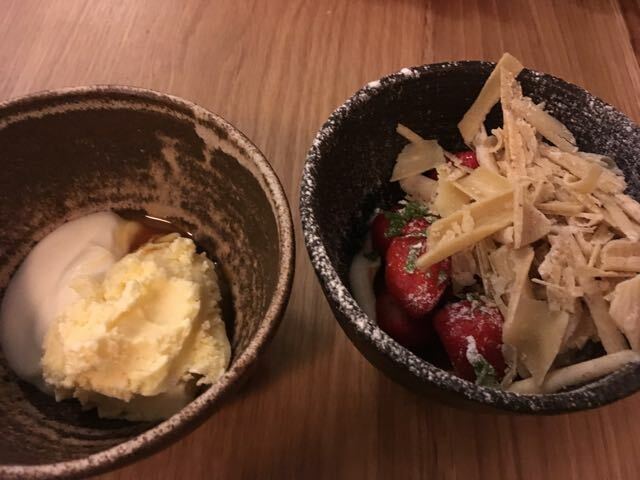 It's the first place I can remember where the growers and producers of the ingredients on your plate were celebrated and their work treated with utmost respect. And it was the first place where I was presented with a bowl of salad leaves that almost jumped off the plate with freshness, dressed and presented with due reverence. It's at Chez Panisse that I've eaten some of my most memorable meals and the experiences have influenced my own growing, cooking and writing. In this book, Alice Waters's takes you, in a very personal way, from her 1950s "Betty Crocker cake-mix childhood", her formative travels through Europe, political engagement and disenchantment, learning the importance of terroir and ending with a chapter on 'Opening Night'. The author's gradual realisation that "food is political" and that the success of Chez Panisse opened doors to projects she had only dreamed of spurred her on to be bold. Everything she has achieved is without actually cooking at Chez Panisse herself. But then, if she had, would she have had the time to put all the pieces in place that make Chez Panisse (and all it stands for) what it is? Her projects, such as 'Edible Schoolyard' are only touched on in this book. Clearly, there has to be a second book picking up where this one leaves off. My copy of The Anatomy of Dessert, out of print for some 70 years, is a Modern Library Food re-print, edited by Ruth Reichl. Edward Ashdown Bunyard was a Kent-born nurseryman who was devoted to pomology (the study and cultivation of fruit) and shared his knowledge in books such as The Anatomy of Dessert. First published in 1929, Bunyard's reference to 'Dessert' in the title refers to the meaning of the word in England at the time, namely the fruit course. Pudding came after, so, don't expect this book to be filled with any sugars except those of the natural fruit kind. And what of the few notes on wine? Well, his love included grapes, of course. Such was Bunyard's love of his subject that his sensuous writing is full of, as Michael Pollen's introduction to this re-print puts it, ".... barely sublimated fruit lust ...". His epicurean passions found release in his book The Epicure's Companion as well as writing hundreds of articles. From Apples through to Strawberries, each chapter lyrically describes the merits of each fruit, its varieties, and when each are at their best. Many of these varieties are, sadly, no longer grown except, hopefully, in some domestic gardens. Reading Bunyard makes you long to taste an Old Transparent Gage plum and realise how impoverished our fruit year is today. I love Ruth Reichl's analysis of why she loves food writing, which she mentions in her Introduction to The Modern Library Food Series- " .... food is a lens through which to view the world." ".... If you choose to pay attention, cooking is an important cultural artefact, an expression of time, place and personality." As every year, there could have been more than 5 books in my selection, but it's a good discipline to stick to, I think. I rarely accept a book for free, so, the books I choose are not based on any feeling of obligation. I hope you enjoy reading about my 2018 personal choices. 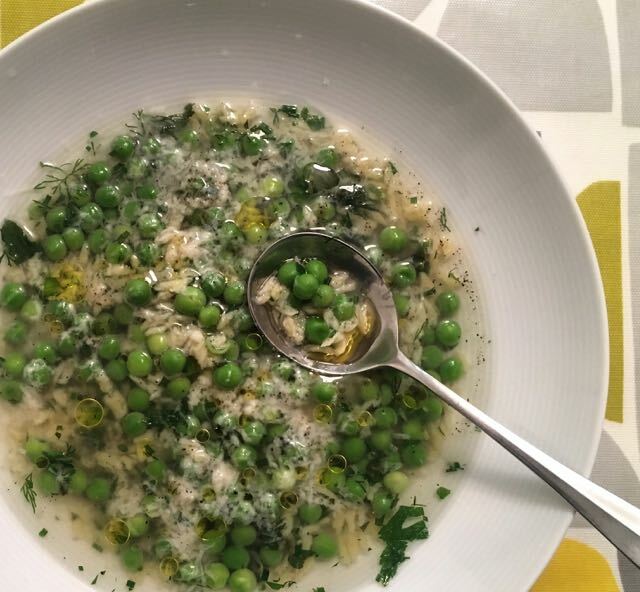 I’ve followed Anja Dunk’s Instagram site for quite a while and, like many others, have been charmed by the posts of her cosy, sometimes chaotic kitchen and dining table. This is no temple to marble and stainless steel, but a true home kitchen. Jam pans bubble on the stove; sturdy shelves are a backdrop, packed to capacity with hand-made bowls and jars of essential nuts, dried fruits, pulses and grains; tiny hands reach across the table for another helping of Schmarren (baked pancake). 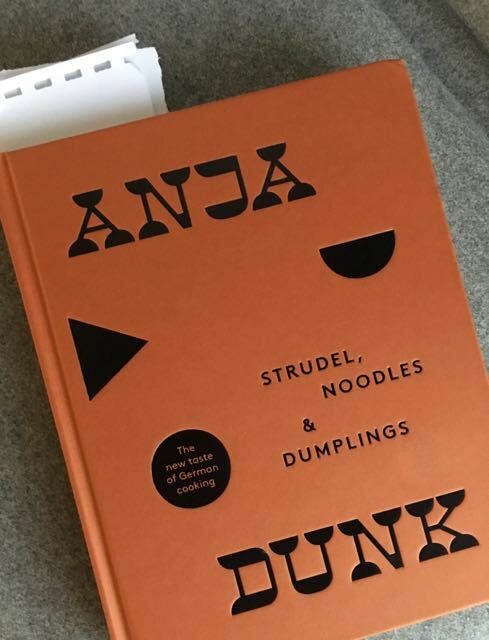 Anja is warm and engaging on social media and this comes across in this, her book, Strudel, Noodles & Dumplings and it’s good to see that her own photographs illustrate the book. She tells of a nomadic childhood, where the food that came out of family kitchens was the constant in daily life, in particular the “pared-back” and “do-able food” of her German Mother. And now, with her own children to care for, it’s this food with a warm sense of family that she brings to her kitchen to instil the association between food and home in them too. But don’t think this is a book about ‘food for children’ - whatever that means. The recipes are laced with flavours of caraway and cumin, tarragon and dill, peppercorns and juniper, allspice and anise. Ferments and pickles have their place too. This is food served up to an appreciative audience of children, family and friends. Each section comes with a short story or anecdote to set the scene to chapters including Simple Comforts, Food for the Soul, Anything Goes, and Something for the Weekend. 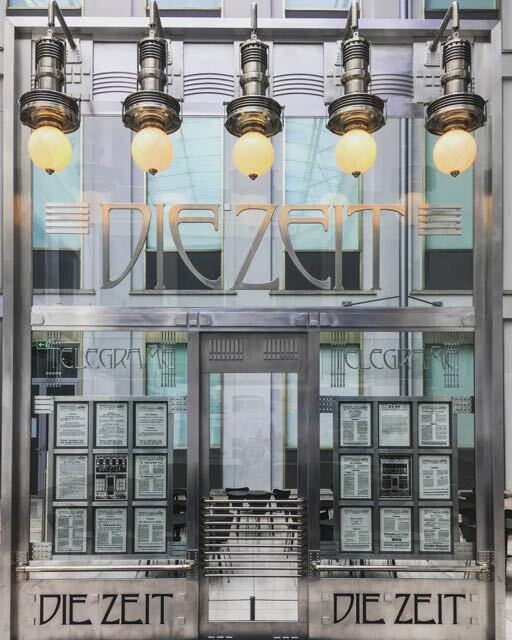 The book is subtitled The new taste of German cooking, making the point that, as with many other European cuisines, German food has been influenced over time by migration and trade. In parallel with Britain, German food has also had to shake off an unfair 20th century reputation for poor food caused by wartime food rationing and the introduction of new, usually American, processed foods that followed. Both countries have, thankfully, regained their culinary equilibrium. Germany has also remained true to its strong sense of food seasonality, its love of baking and myriad ways of preserving from smoking to bottling. 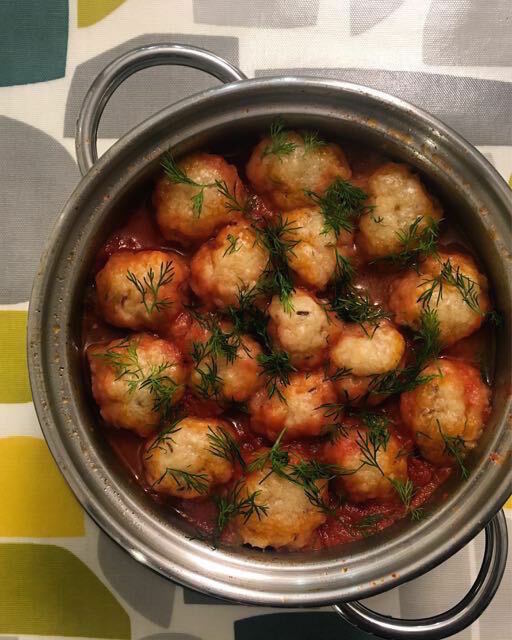 Anja sums up home-cooked German food as “gently spiced, smoky, buttery, yet sweet and sour”, as “warm and hearty and vinegar-laced”. All of this is in the book, along with a sprinkling of inspiration from three enthusiastic little eaters. So what have I cooked? An unusually good (for me) carrot harvest led me to Caraway Dumplings with spiced carrot. With such a basic main ingredient I made sure I used a good passata that became lusciously thickened by the topping of floury dumplings. A small amount of Speck, or smoked bacon in my case, and a good dose of sweet paprika added deep savour. As I’m a sucker for broths, Reibele in a herby pea broth was an obvious choice. Any recipe that calls for frozen peas and lots of herbs is going to get my attention too. But what is Reibele, you may ask? A tiny grated noodle that cooks in a minute. I made the egg-less version and can’t say I found grating the noodles easy (I suspect I didn’t knead the dough enough) but they cooked up just as the writer said they would. Such a simple recipe does rely on a good vegetable stock and not stinting on the herbs. 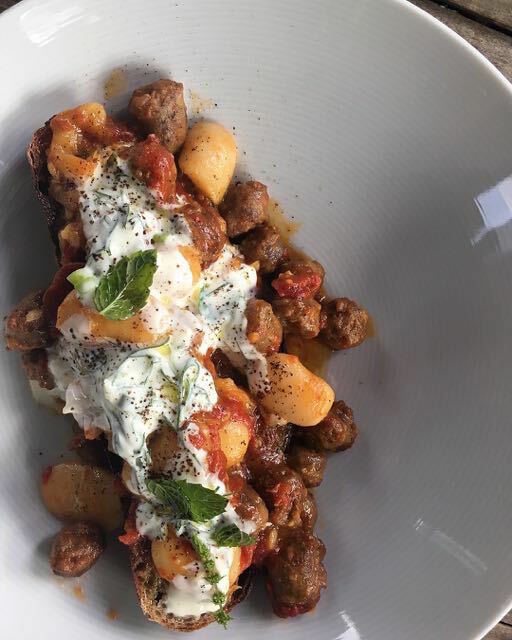 Merguez sausage with butter beans and roasted red peppers has been on the menu several times already, which says it all. The main ingredients are further spiced up with cumin (optional but not in my case), black pepper and sweet paprika and piled on toasted bread then tempered with a herb yogurt. Only one sweet dish so far, though a couple of jars of rum-laced Not Just a Strudel Filling has saved the day several times. 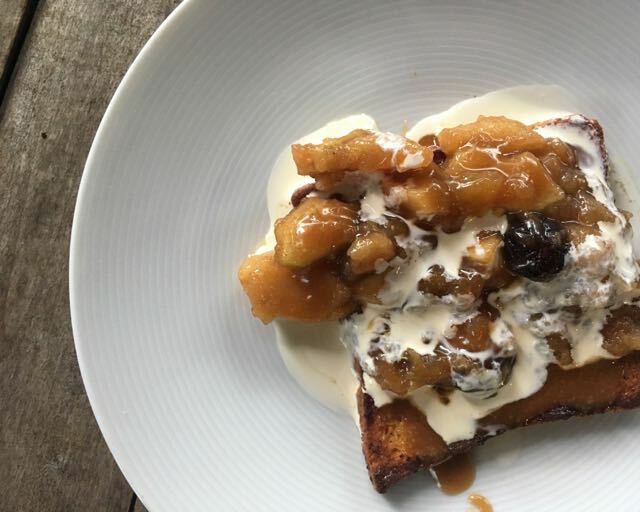 Used as a filling for buckwheat pancakes, a topping for Pain Perdu and simply topped with vanilla ice cream. And I still haven’t made Apple Strudel with it. But then there are four other Strudel recipes to consider, including a Spiced Plum and Walnut at some point. It’s so obvious that the dishes in this book have been made over and over again. This is no-nonsense home cooking by someone with a great understanding of flavours and how spices work together. Every recipe I’ve tried so far has worked perfectly. Other recipes I have bookmarked include Beer Dumplings with creamy juniper mushrooms, Chestnuts with mushrooms and marjoram, Baked Buckwheat with cinnamon sugar and cream, Steamed Dumplings with plum jam and poppy seeds, Strawberry and cinnamon soup, Blueberry Buttermilk and that Schmarren, of course. And I look forward to a Four O’Clock Cocktail of Black Tea with Rum after a long walk “in the depths of winter when the air is crisp and bodies are drawn to each other in a huddle”. Anja very kindly sent me a copy of this book. One of the joys of taking on an allotment plot is the things you find not only on other plots but in the unworked spaces around them. 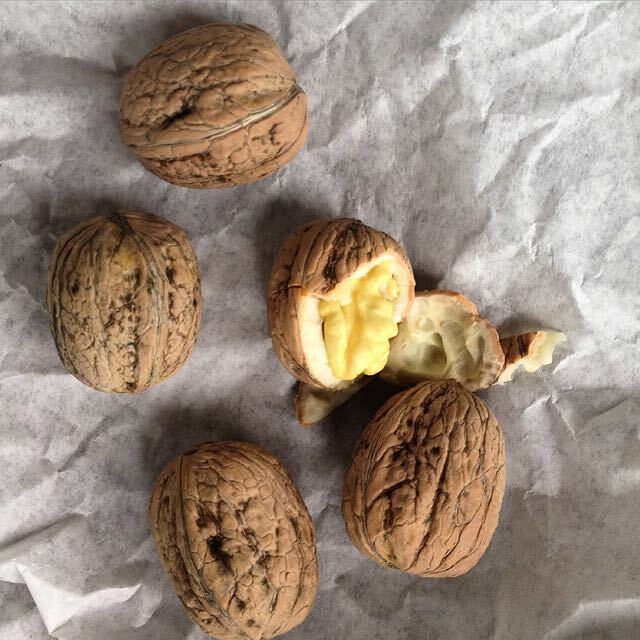 I’ve written before about the walnut tree, discovered thanks to the unearthing of a squirrel's larder, but it remains one of my favourite finds. Clearly a young tree, untamed by any human hand, once again this spring I watched soft buds emerge from grey branches that, through winter, looked and felt iron-hard and unyielding. Within a few weeks the lower branches began to drape into the surrounding long grass like the elegant arms of a dancer reaching for the ground. The beauty of the tree is not only in its looks. Those low-hanging branches make for easy harvest of its fruits. Around the end of June, when the outer casings were a smooth, bright green and still releasing a resinous aroma. I harvested just enough young walnuts to fill a large Kilner jar. *Quartered, they showed themselves to be at the perfect stage - the inner sweet nut soft and not quite formed. They relaxed in a bath of cheap vodka, some sugar, lemon peel and a few spices for six weeks on my balcony. Passed through muslin, the deep brown liquor now sits in the deepest recess of my larder, not to be touched before Christmas arrives. Then a rich vanilla ice cream will be calling for an anointment of luscious, sticky, bitter **Walnut Liqueur. The walnut tree seems so quintessentially English, yet it’s a non-native tree. Brought by the Romans, the tree Juglans regia is here at its most northerly reach. The common name of 'English Walnut' for the tree is used here to distinguish it from the American 'Black Walnut' but it originated in China and south-east Europe. Our recent warmer summers have seen the trees fruiting better than ever. This week I took another bagful of walnuts from the tree. Their casing now a softer, rougher green but not yet peeled back exposing the hard, brown under-layer we are more familiar with. These are at the 'wet' stage. Peeling back their green jackets and cracking them open now reveals a fully formed, slightly tacky nut. We will eat some over the next couple of weeks, enjoying their sweet, almost milky taste which pairs so well with salty sheep's milk cheeses. If there are any left I will dry them for storing by leaving the husk-less nuts spread in a single layer in a warm, dry place for two weeks. I promise, while I've been doing this squirrelling-away, I've made sure to leave plenty of walnuts for the birds, and the squirrels. 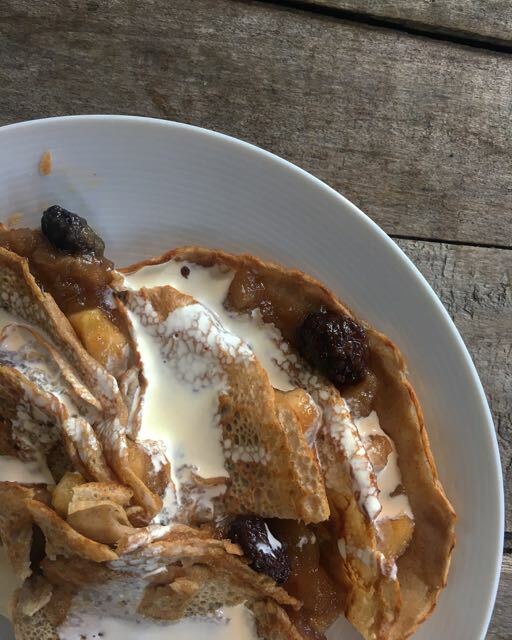 Spoon some of the warm apple and raisin compote onto each pancake and add some of the chopped walnuts folding the pancakes over. Serve with cream. 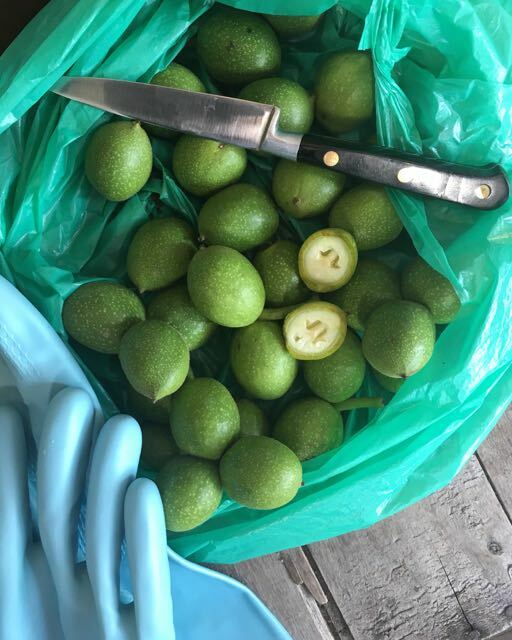 *Always wear gloves when handling walnuts that have their green outer casings intact as the tannins are highly staining. **David Lebovitz has a recipe on his website for Liqueur de Noix. 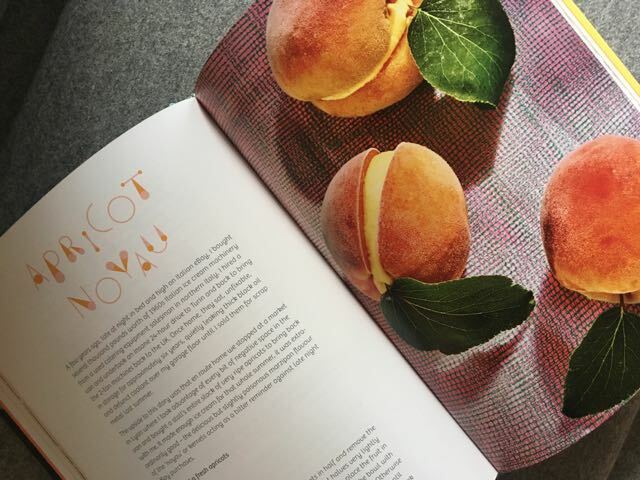 In Italy it is known as Nocino and my go-to recipe can be found in Kitty Travers's brilliant book on the subject of ice cream, La Grotta Ices. Before I say a word about this book - La Grotta Ices which was published in June - I have to declare I know the author. Given the trajectory of her career, I'm sure I ate Kitty Travers's food at a couple of favourite London restaurants before we met. I love a good pudding, and ice creams in particular, so a good pastry chef is to be treasured. Then I spotted a little Piaggio Ape van whizzing across south east London. It was driven by a willowy tall, rosy-cheeked woman who seemed to have found the secret to happiness. And she had. She had followed her dream. I'm not sure of many things but I firmly believe we all have ice cream memories. Often it's that first lick of Mr Whippy soft-scoop vanilla (with a chocolate flake if you were flush) in a dry, brittle, tasteless cone. It's a memory of taste, time and place that stays with us. For me it's the jingling sound of Greensleeves announcing the arrival of the ice cream van. A strawberry Mivvi, please. For Kitty Travers, her memory is a slice of supermarket economy vanilla brick that, after suffering several re-freezes emerged from its damp cardboard box as a "curious foamy gum". I remember it well. I suspect few of our first ice cream memories would stand up to much scrutiny on taste, but they are no less fondly held. As with most things, once you've tasted the good stuff, you want more. In Kitty's case it was the flavours of abricot, cassis, groseille, and callison in a little glaciere off the Croissette in Cannes that began the seduction. A scoop of ice cream became part of her morning ritual before a 16-hour waitressing shift. 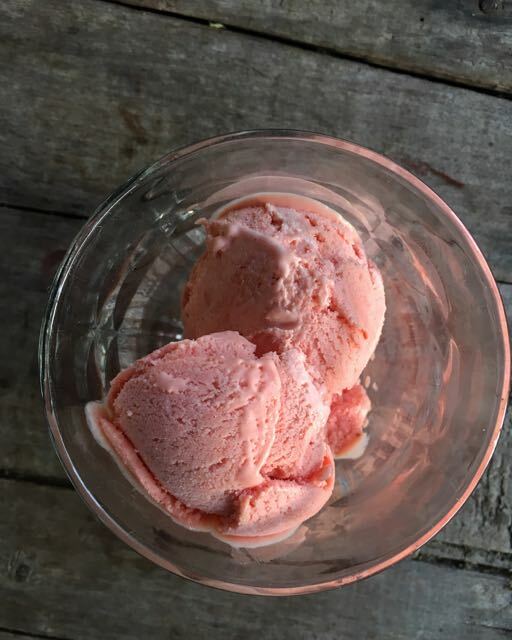 A dip into Jeffrey Steingarten's book The Man Who Ate Everything, specifically the chapter "The Mother of All Ice Cream", fed a passion to discover how such flavours could be delivered in the form of ice cream. 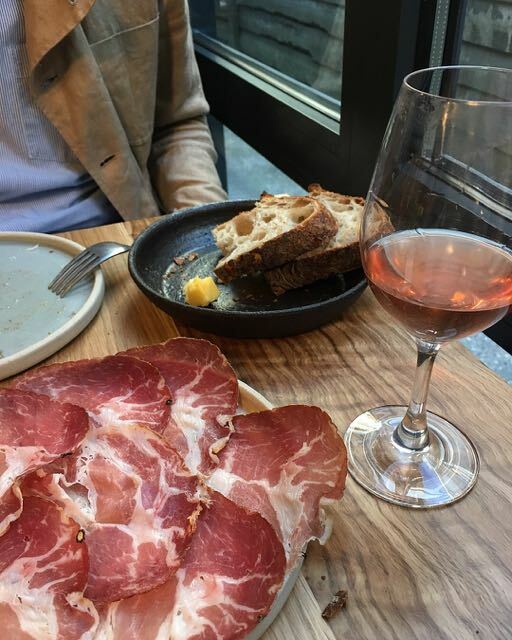 An inheritance allowed her to fly to New York to study and to 'stage' for Mario Batali and Meredith Kurtzman at Otto Enoteca and for Gabrielle Hamilton at Prune. She thrived and then the visa ran out. The boost to her confidence returned her to London where Fergus Henderson was only too pleased to employ her at St John Bread & Wine where she scooped up her first ice cream - Fresh Mint - as pastry chef. Holidays in Italy were spent working, sampling and learning about gelato in the best places for it - Rome, Naples and Sicily. Not all was 'la dolce vita' and decision time came when she was assured by a gelato maker that she could never learn to make ice cream like an Italian (being in her twenties, she was far too old!). She decided there and then that she would try to do something "relevant to the place" she came from and "make it perfect". She would make ice cream. La Grotta Ices was established in London in 2008, named in recognition of that little glaciere in Cannes which fed her early ice cream dreams. If the La Grotta Ices book doesn't make you value the importance of seasonality, nothing will. The order reflects the author's ice cream making year which changes constantly as ingredients come into their, often short, season and then bow out. She reminds that if you buy with seasonality in mind you will find fruits that are not only ripe and tasting at their best but good value too. Achieving the perfect balance of water, sugar, fat, solids (proteins) and emulsifier is key. 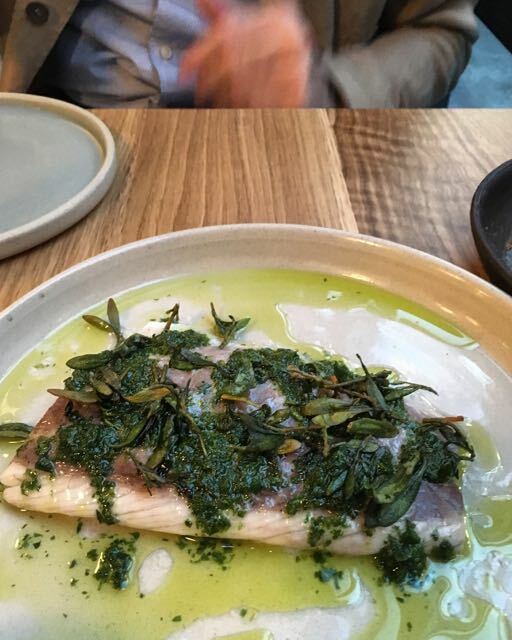 The ethos is fresh, seasonal and minimally processed. Expect recipes to include milk, cream, eggs, sugar, fruits and natural flavourings. You'll find no 'fat-free' here, unless it's a sorbet - thank goodness. There's imaginativeness in flavours and textures in these 75 recipes but no 'let's see how off-the-wall we can get'. Some combinations are creative and surprising but always thoughtful. The recipes start logically in January with the arrival of sharp citrus fruits from Italy, their peels rich with oils, put to use in Kumquat Custard; Blood orange & Bergamot Sherbert; and Mimosa (blossom), Seville & Orange Rice. We move through spring and summer's rhubarb, strawberries, cherries, peaches, apricots, blackcurrants and resiny early Pigeon Figs with ice creams like Leafy Blackcurrant Custard; Apricot Noyau; a sorbet of Tomato & White Peach; and Pigeon Figs & Pineau de Charentes. Early autumn brings sticky figs, grapes, melons, plums, pear and quince, so we have Damson Grappa; Melon & Jasmine Sorbet; Pear, Myrtle & Ginger. Late in the year there's a turn to richer flavours in the form of nuts, dried fruits, candied peels, butterscotch and malt so you'll find Pistachio; Medici Almond; and Butterscotch & Agen Prune. Herbs, geranium leaves and fruit leaves are valued too, particularly useful if you are waiting impatiently for your fruits to ripen as the leaves (some are poisonous, so check) deliver interesting flavours on their own as well as adding another dimension to fruit ice creams. There are recipes for Mint Chip; Blackberry and Rose Geranium; Blackcurrant Leaf Water; Peach Leaf Milk Ice; and several uses for the sublime fig leaf. The writing around the recipes is pitch-perfect. Little vignettes of the author's adventures in pursuit of a true passion: Memories of breakfasting on poached quince after feeding the livestock on an Urbino pig farm. How to avoid, or enjoy, a Prickly Pear. 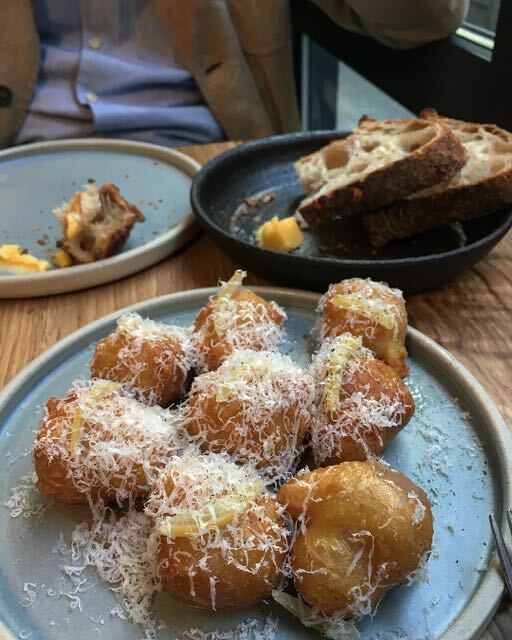 How eating too many Kiwis in the name of love led to a visit to a cowboy-hatted doctor, the part played by Mussolini in the drama, and how Italy can be too much if you're not careful. There's good advice too, like: Keep your Loganberry source to yourself - they are as rare as hen's teeth and short in season; why good quality cocoa powder works better than chocolate in ice cream; keep your eyes open and nose alert to walnut trees and lemon verbena bushes on common land; after sieving berries, use the pips for making a pip juice; and eat chocolate pudding flavoured ice cream with a good friend so they can wrestle it from you before you polish it off in one go! 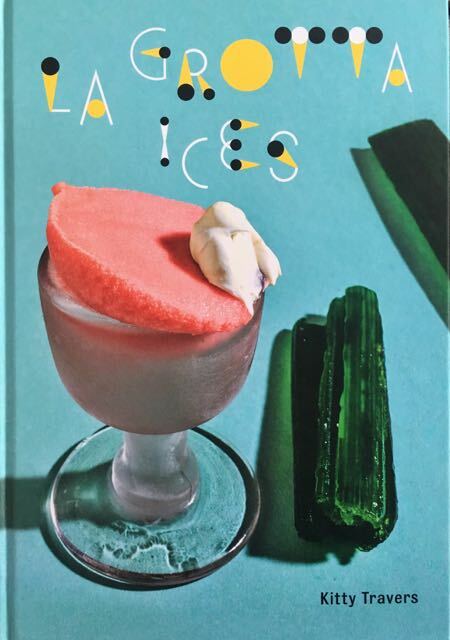 I am certain I will make every recipe in this book because I have the advantage of knowing just how good La Grotta Ices is. I already have summer favourites like Strawberry Salad, Tomato and Peach Sorbet and Leafy Blackcurrant Custard. 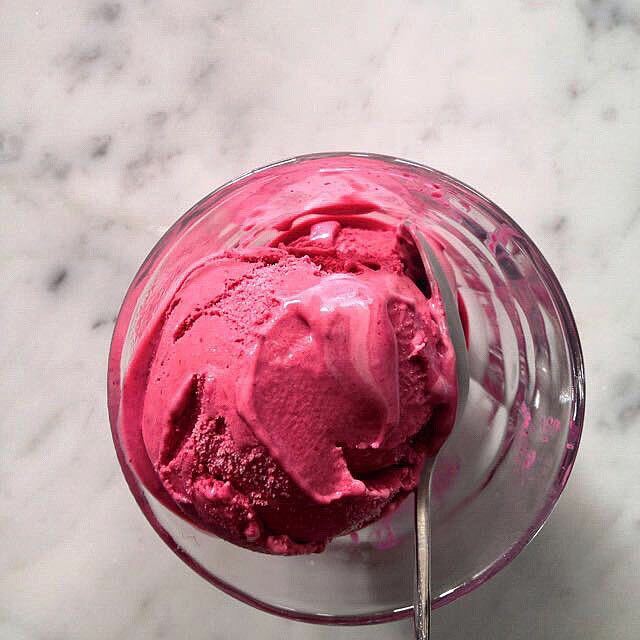 I badly want to make Tamarillo ice cream because of its thrillingly tropical flavour and the sumptuous colour it takes on; Carrot Seed because I'm a grower and I'm intrigued; Lime and Botanicals because I like a nice G&T; and Pistachio because it's pistachio. The artwork in the book is eye-catching and fun and photographs, by Grant Cornett, capture perfectly the nostalgia around our ice cream memories. I should tell you too that I attended one of Kitty Travers's early teaching classes at The School of Artisan Food. She still runs regular Introduction courses there so I have included a link just in case you want to catch, as I did, some of her infectious enthusiasm for her passion. 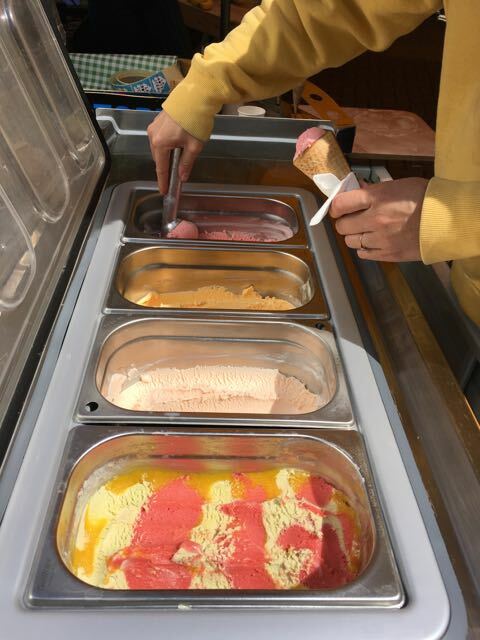 And here's a link to the La Grotta Ices site for up-to-date info on where you can buy the ice creams in London. I don't know about you, but I still wouldn't turn my nose up at my ice cream memory - though I'm told my Strawberry Mivvi has slipped from its stick for the last time. Probably for the best. 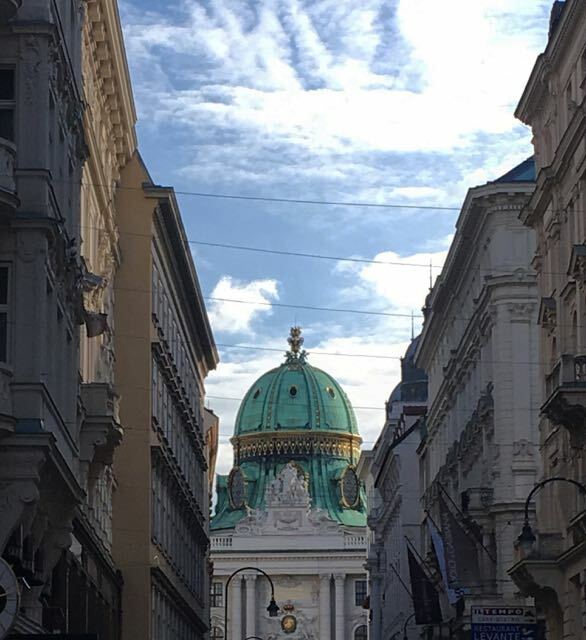 It was more than 30 years since I'd walked the streets of Vienna. Back then, in the space of a couple of hours we went from a balmy autumn London in October to grau winter in the Viennese capital. Over three freezing days we layered-up in every stitch of clothing we had. The streets were eerily quiet, making it very easy to conjure up the feeling that Harry Lime was watching from that shadowy baroque doorway (you must have read, or seen, The Third Man). Vienna was a city at the intersection of East and West Europe - the Berlin wall had not yet fallen. 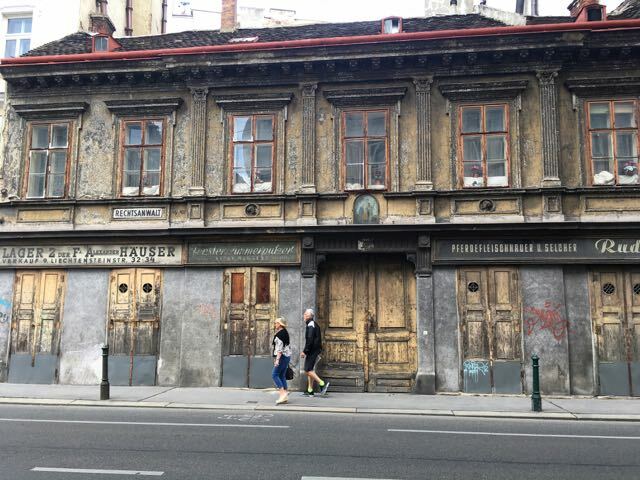 We walked the, what seemed to us, melancholy streets, ducking into churches, admiring the Baroque beauty along with the Juendstil (Art Nouveau) Modernism. We took brisk walks in the freezing landscapes of the central Stadtpark and crossed town to Vienna's south eastern reaches to find the Schönbrunn, which was closed! The roasted chestnut sellers were a godsend. The hot, blistered nuts bought to bury deep into our coat pockets to warm frost-nipped fingers until we could dive into a coffee house for Kaffe und Kuchen (Demel was our favourite). The atmosphere may have exuded an air of mournfulness but the art on the walls of Vienna’s galleries dazzled. Cash was tight. Anything that was free-to-see was seized upon. The vibrant eroticism of Gustav Klimt’s portraits and friezes and Egon Schiele’s challenging and, sometimes, disturbing, body of work made a big impression. Now we were back, this time in high summer, wondering whether that air of Traurigkeit (mournfulness) was real or all down to the weather. 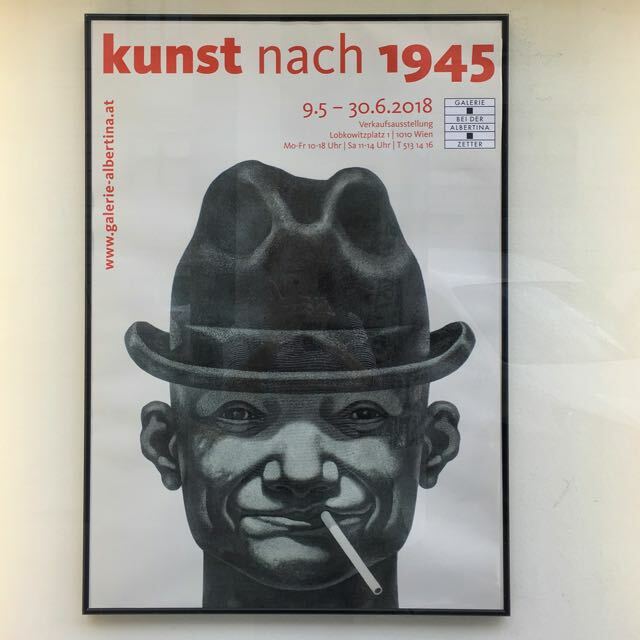 The draw this summer was the art as 2018 is an important anniversary year in the artistic history of Vienna. It's 100 years since Klimt died of Pneumonia, to be followed 8 months later by Schiele who succumbed to Spanish Flu at the age of 28. Between those losses, Otto Wagner - architect, urban planner, teacher - who took Vienna's architecture into the Modernist era, died. All three were members of the revolutionary artist's association, Vienna Secession. 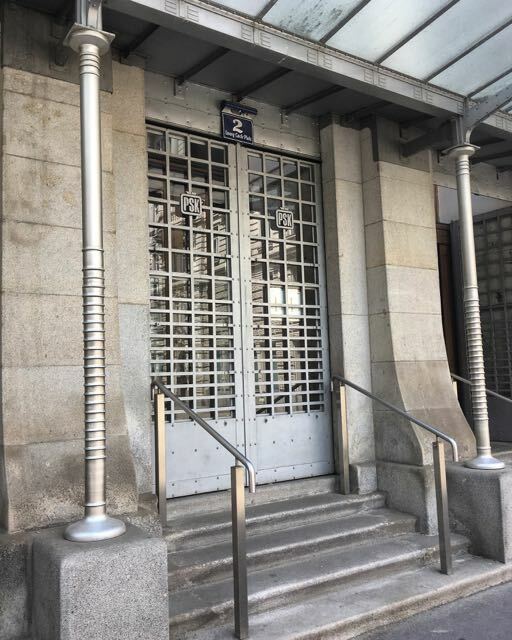 Like other European secessionist group, members sought to separate themselves from the art of the past and it was closely linked with art nouveau or jugendstil. So, what better place to start than to create their own exhibition space - the Vienna Secession, Association of Visual Arts. Though, on this visit, the outside was the nearest I was able to get to this decorative beauty close to Karlsplatz. 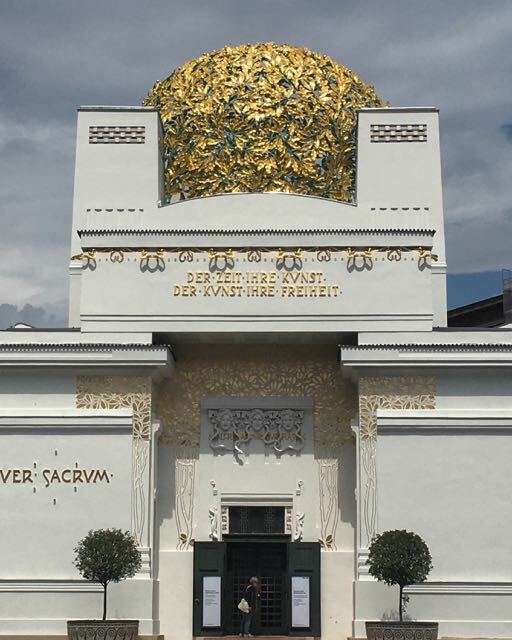 It was designed by one of the co-founders of Vienna Secession, Josef Olbrich. Inside, Gustav Klimt's Beethoven Frieze is the big draw but there is a constantly changing programme of modern-day artists' exhibitions. Next the Wien Museum, the venue for the Otto Wagner jubilee exhibition (until 7 October 2018). Spanning the 19th and 20th centuries, Wagner's visionary designs offered a clear break from the past. For many defenders of the past, his modernist ideas which incorporated new building materials were too radical and many of his projects remained unrealised. 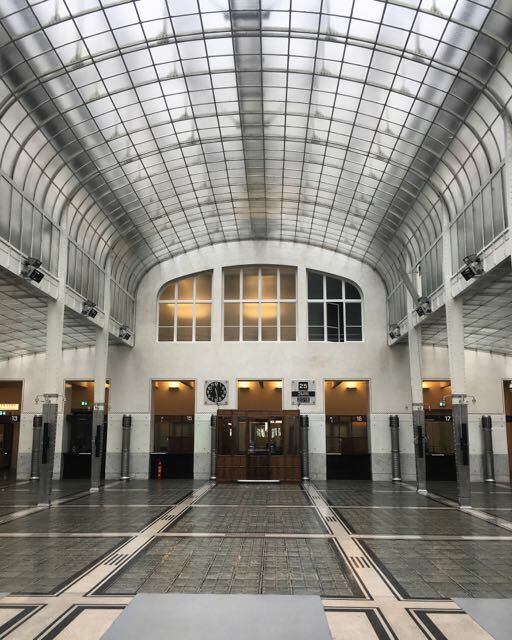 Even if you don't make it to the Wien Museum exhibition, don't skip wandering into the Austrian Postal Savings Bank - Osterreichische Postparkasse - Wagner's most modern and important work. Every detail bears Otto Wagner's hand, from door handles to counters to stools, lighting and clocks and were designed around his principle "What is impractical can never be beautiful". Simply stunning. 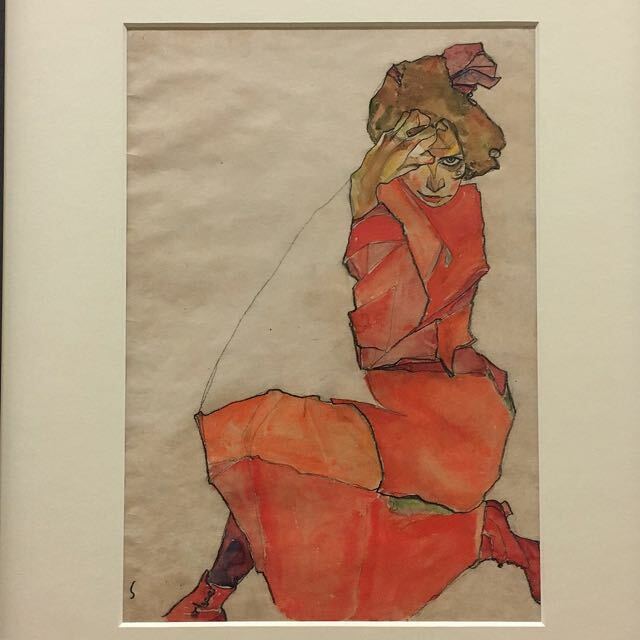 The Leopold Museum was hosting the Egon Schiele: The Jubilee Show (until 4 November 2018). Schiele is the central artist of the Leopold's collection so, as I had hoped, this exhibition was the most comprehensive collection of the artist's work I've ever seen. So hard to choose just one photo to illustrate this visit. 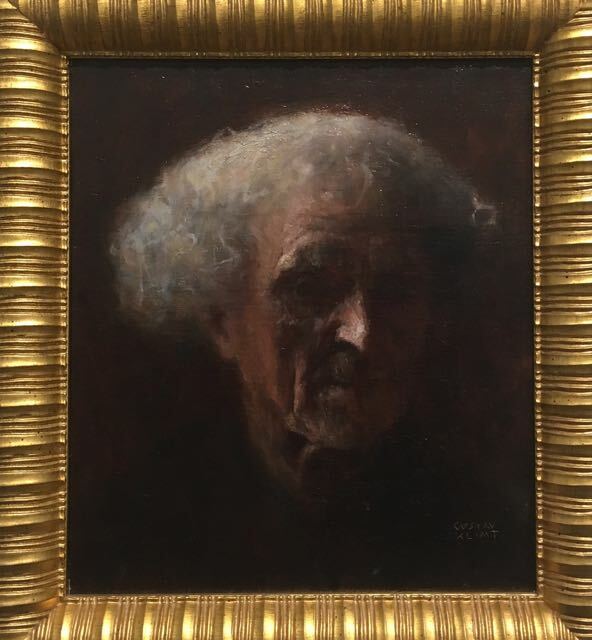 The Leopold Museum was also the venue for Gustav Klimt: Artist of the Century (until 4 November 2018). The chance to see a Gustav Klimt exhibition is never something I would pass up, but I think my appreciation of this one suffered from having seen the fantastic Schiele exhibition first. Damn it, we didn't make it to the Belvedere on this trip, nor the Albertina. You really should! Time for a drink and something to eat. A cocktail at Loos American Bar, of course. But before the drink, there's the architect. Adolf Loos, designed this small, stylish, fin de siècle bar with his uncompromising commitment to lack of ornamentation. Everything had to be economic, practical and functional in his work - views that were at odds with the Secessionists. Mahogany, marble and onyx were used to great effect. Loos's modernist works would influence Le Corbusier and Mies van de Rohe. And the cocktails? A Corpse Reviver No.2 and a Blackthorn English were fine. As you can imagine, absolutely everyone from Sigmund Freud to Egon Schiele have crossed the threshold of Loosbar. I wonder what they'd make of it now? Got to say I was not taken with the invitation to "Lady Drinks" on Sundays! Our food memories of Vienna were of the traditional rib-sticking Austro-Hungarian variety - nothing wrong with that, especially in winter. There was Wiener Schnitzel, Tafelspitz, and a glorious Goulash. Had much changed on the food front? We arrived just in time for a late lunch at Meierei in the centre of Stadtpark and ate Goulash followed by Apfelstrudel for old time's sake. Meltingly tender beef in a sticky, lip-smacking sauce cut by sweet-sour pickled vegetables. 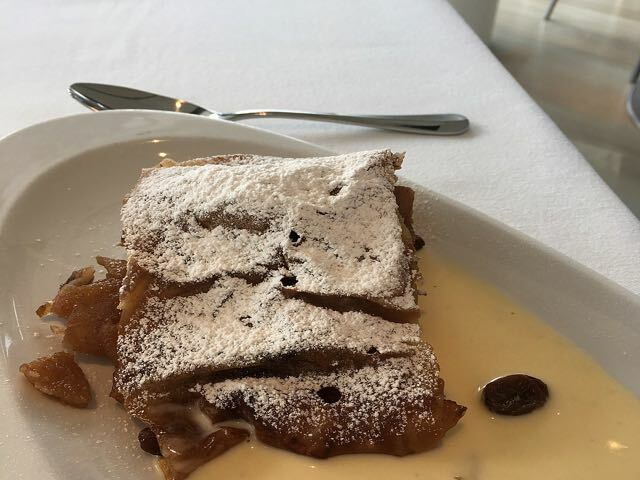 A fresh from the oven slice of Apple Strudel with the lightest vanilla sauce. Huge windows open out onto the terrace where tables are set in fine weather. 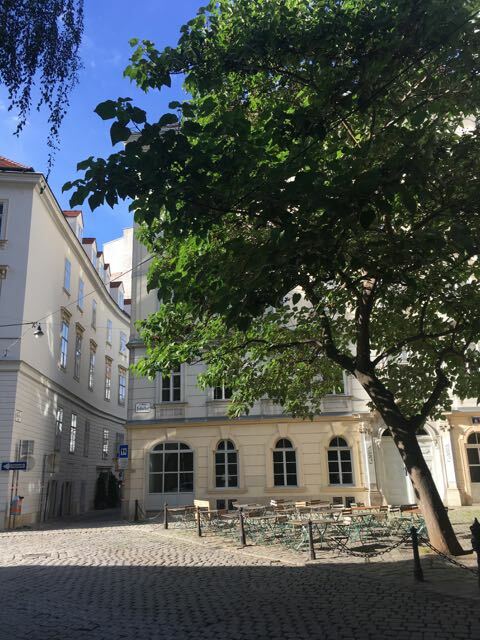 With only the footpath above the Wienfluss between you and views over the park, it's a lovely oasis of calm in the city. We didn't eat at its ** Michelin sister restaurant Steirereck alongside but I'm assured it's well worth the price. The restaurants share an impressive cheese cave where 140 varieties of cheese - though mysteriously only one British example - await the dedicated europhile. For dinner we took the Metro north to Friendensbrucke station to eat at Mast Weinbistro - so good we ate there twice. 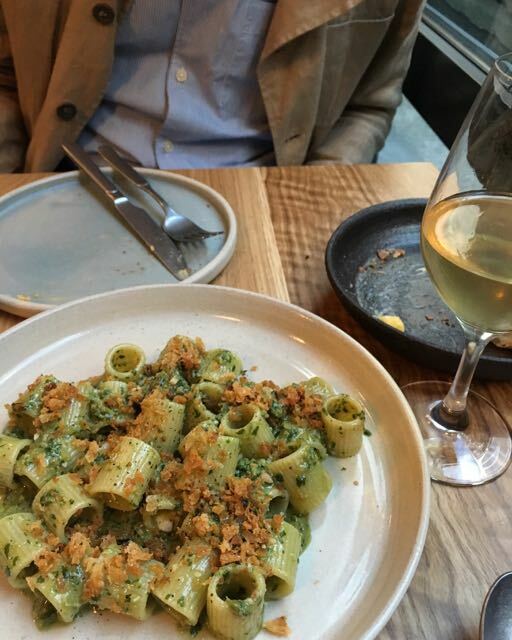 This natural wine bar and bistro was perfect when you tire of the hearty traditional. Though a dish of Smoked Pork and sauerkraut was on offer and happily eaten, as was the Stewed pork belly, chanterelles and green beans - the lightness of touch to both was much appreciated. A Confit fillet of Arctic Char, bell pepper and zucchini was given zest by a little preserved lemon and a light cream basil emulsion. The spicy notes of the basil and salt/sour of the lemon bringing just enough flavour and interest to not overpower the delicate fish. Small plates of Mushrooms, peas, chicken skin and basil and Turnip, lentil humus and sesame were ideal with the excellent bread and raw milk butter to start. The bread is bought in from Offerl a backerei an hour north of Vienna where the baker George Offerl made the excellent decision to take the family bakery back in time. It ticks all the right boxes: organic ingredients, rare grains, handmade and most of all the breads taste fantastic. You won't find this bread in many places in Vienna. There was a particularly notable bottle of Weingutwerlitsch Ex Vero I but all the natural wines were good. Here you can also taste roasts from Jonas Reindl's coffee - not supplied to just anyone in Vienna. We didn't get to Jonas Rendl's own coffee bar but it would be a must for any future visit. 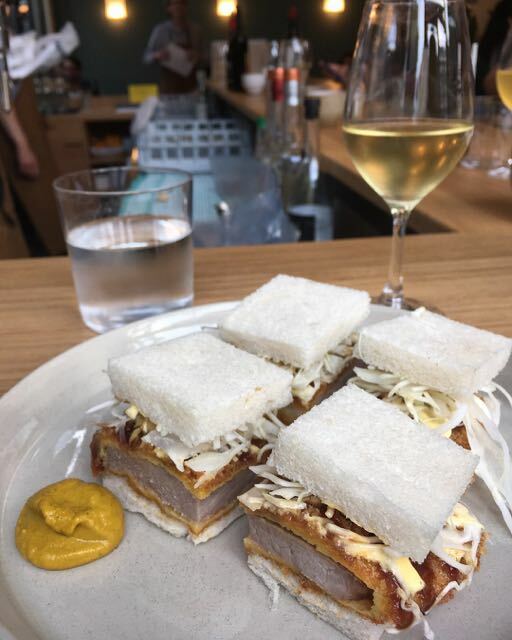 Elsewhere we were reminded of the joys of a simple bowl of beef consommé with shredded pancake and a plate of white asparagus with boiled potatoes and hollandaise but we searched in vain for a slice of Dobos Torte (cake) even in Cafe Central. And, yes, we did return to Demel for kaffe und kuchen and, inevitably, found it not to be the haven we remembered but don't let that stop you. Parémi on Backerstrasse is a French style Boulangerie, Patisserie which became our favourite breakfast spot on this visit. The young owners, Patricia and Remi have the baking and the service completely spot-on and it's a lovely, friendly place. 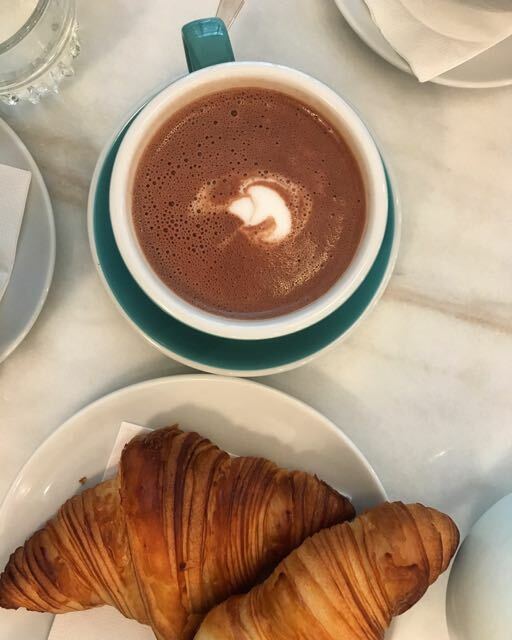 The pastries are outstanding and I can recommend the croissants with hot chocolate. The patisserie tastes every bit as good as it looks and it was no surprise to learn that Pierre Hermé is a hero. If you want more ceremony over breakfast, Meierei can provide it. 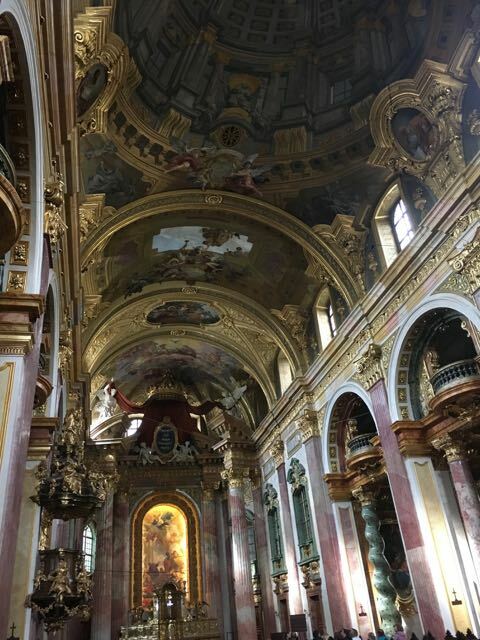 Vienna has a copious number of churches, many decorated in elaborate baroque style. The Jesuit Church at Dr Ignaz Seipel Platz may look plain from the outside but the interior is anything but. Extravagantly ornate decoration in jade green, pearly pink, blood red and gold awaits. And church music is still something easily found in Vienna. Green spaces are always a necessity, for me, in cities. In Vienna, apart from Stadtpark, which we found ourselves cutting through often, there is Schönbrunn Palace - the Palmenhaus in the park in particular. And the Gartenpalais Liechtenstein - if you remember to book ahead for a guided tour, there is the Palais Liechtenstein there too - the walking route to which was where I found the deliciously decaying stretch of street (on Liechtensteinstrasse) in the photo above. So, was there still a cloak of Traurigkeit hanging over Vienna? Maybe, after all, long summer days was all it took to lift the mantle. The atmosphere was positively heiter. A book that encourages a slow stroll.